You get 25% off of retail prices when you sign up as a Wholesale Customer or Wellness Advocate. 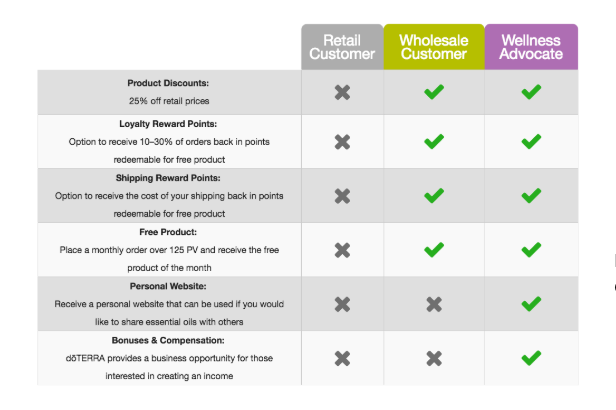 doTERRA offers product through a yearly wholesale membership, and when you sign up with a kit, the sign-up fee of $35.00 is waived. After becoming a Wholesale Member, the yearly renewal fee for a wholesale membership is $25.00. This renewal fee comes with a free bottle of Peppermint, one of the most popular oils doTERRA offers, a retail value of $27.33. Please see the graphic on the left that describes your options. Our most popular is the Wholesale program.